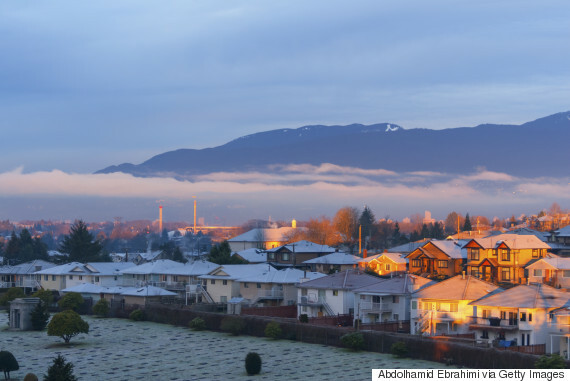 “Don’t borrow what the bank is willing to lend you..."
When Rory Green set out to buy a home, she and her husband sought out the ugliest apartment in Greater Vancouver’s housing market. The university fundraising professional is joking when she says that. But the pair reasoned they would have to buy a place and put some “elbow grease” into it if they wanted to stay within their price range. 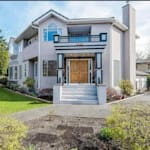 Sure enough, they found something that needed some love — a two-bedroom townhouse with a green living room, an orange kitchen, and a carpet stained with blood and bleach in the Vancouver suburb of Coquitlam. In order to afford a home in pricey Greater Vancouver, Rory Green set out to to buy a fixer-upper. The pair bought it, with plans that 20 years from now, it would be paid off. They made a 30 per cent down payment, securing a mortgage with an interest rate of between two and three per cent that won’t change for four years. After that, neither they, nor any other couple who bought a home in recent years, can be certain of borrowing at such a favourable rate. 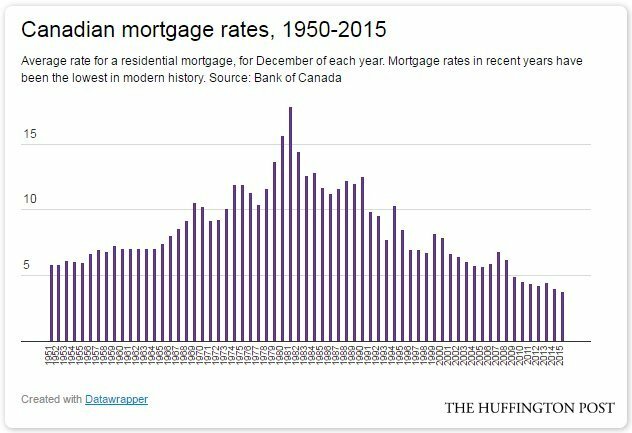 Canadians today are paying the lowest mortgage rates seen in records going back 66 years. It isn’t just Canada; interest rates worldwide are at their lowest in recorded history, according to the Bank of America. “I know it’s not always going to be this good, and I think assuming things are always going to be as good as they are now, in terms of the amount of expenses I have and in terms of interest rates, is not a good way to set myself up for success,” Green told The Huffington Post Canada. Some "official" posted rates are higher, but most lenders in Canada today will give you a mortgage for 2.5 to three per cent. An analysis by The Huffington Post Canada has found that a return to a mortgage rate of five per cent — the “normal” rate for years prior to the financial crisis — would put severe pressure on many Canadian homeowners. The average mortgage payment on a house bought at today’s average price ($503,301) would rise by $620 per month, from $2,078 to $2,698. 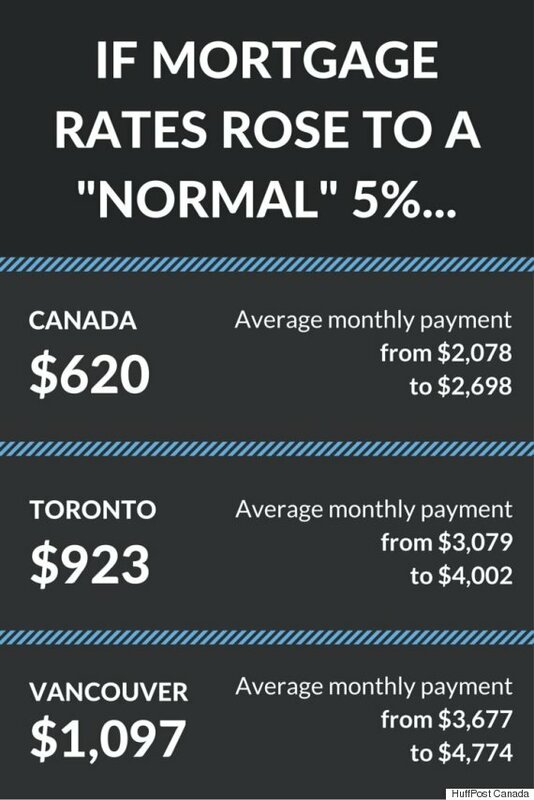 In Toronto, average payments on an average-priced house would rise by $923 per month, from $3,079 to $4,002. In Vancouver, payments would rise by $1,097 per month, from $3,677 to $4,774. Given that a recent poll found half of Canadians couldn’t even afford $200 more in monthly payments, those projections paint a frightening picture. Canadian households have “a huge vulnerability to any hike in interest rates,” said Jeremy Kronick, a policy analyst at the C.D. Howe Institute. Kronick said Canada needs to fix housing affordability issues before interest rates begin to rise. It’s “debatable” whether tightening mortgage rules works, he said, preferring to see government policy change to make it easier to increase the supply of housing — for instance by loosening zoning rules and other land use restrictions. But can that be done before interest rates rise? “I’m not convinced interest rate hikes are coming,” Kronick said in an interview. Not everyone is sure of that. The Parliamentary Budget Office earlier this year predicted interest rates would rise to “normal” levels over the next five years — a period of time during which most of Canada’s mortgages will come up for renewal. It sees a risk of Canadian households falling into a debt crisis by 2020. “The financial vulnerability of the average household would rise to levels beyond historical experience,” the PBO said. John Andrew, the director of Queen’s University’s real estate program, lays some of the blame for the current situation with mortgage lenders. “If you go to the banks’ websites, they will tell you what they will lend you based on you being completely maxed out,” he said. The effect of that is becoming evident. The Bank of Canada says the share of households with very high mortgage debt — above 450 per cent of household income — jumped to 15 per cent of all borrowers last year, from 12 per cent just the year before. Looking at banks’ mortgage calculators, HuffPost Canada determined that some lenders are willing to issue mortgages that would eat up 44 per cent of household income — way above the 30-per-cent affordability guideline issued by Canada Mortgage and Housing Corp.
“stress-test" mortgage borrowers to see if they can actually afford to pay higher mortgage rates. “I don’t see that [the banks] are doing that at all,” he said. Lenders are required to make sure borrowers are able to pay at the Bank of Canada's mortgage qualifying rate, which most recently sat at 4.64 per cent. But there's a major loophole: For five-year, fixed-rate mortgages, banks don't need make sure borrowers can handle the Bank of Canada's rate -- they can qualify at the lower, discount rate offered by the bank. The five-year fixed-rate is one of the most common mortgages in Canada. Green doesn’t lose sleep at night worrying that interest rates could rise. If they did, she could go back to her lender and lengthen her amortization period to make it more affordable — 25 years, say, instead of just 20. She’s less confident, though, about people who have borrowed more than they can afford. She admits to being shocked at what she learned she could have borrowed. “Honestly, the thought of owing that much money made me feel uncomfortable,” Green said. That’s not the case for borrowers who have maxed themselves out. As Andrew notes, you don’t have to borrow as much as the banks are willing to lend you — and you probably shouldn’t. Andrew advises homebuyers to go to an online calculator and figure out their payments at an interest rate that’s three percentage points higher than their current rate. To calculate these mortgage payment estimates, we used mortgage calculators provided by Canada Mortgage and Housing Corp. (CMHC) and Mortgage Intelligence. The estimates are based on the average house prices for June 2016, provided by the Canadian Real Estate Association (CREA). Those would be $503,301 for Canada as a whole; $746,546 for Toronto; and $1.026 million for Vancouver. The numbers assume a 10-per-cent down payment, except for Vancouver. CMHC has stopped insuring mortgages for properties above $1 million, so an average-priced home in Vancouver would require an uninsured mortgage with a minimum 20-per-cent down payment.